"This will make you want to pick the strawberries yourself!" Combine sugar, gelatin, cornstarch, and salt in a medium saucepan. Stir in boiling water. Boil mixture for 3 minutes over high heat, stirring constantly. Cool completely. 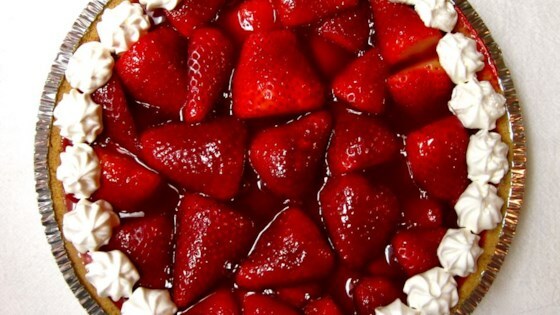 Arrange whole strawberries in pastry shell. Pour gelatin mixture over berries. Chill before serving. Top with whipped cream. The glaze is great, but I lined my pie crust with 8 oz softened cream cheese before I added the strawberries, to keep the crust from getting soggy, and add richness. We thought this was absolutely delicious!! I even made more pies for friends and they raved about them. This is definately a keeper!!!! This recipe tastes just great... I also put creamcheese on the pie crust which add some richness to the pie.. BIG APPLAUSE FROM THE FAMILY!! !